Birds are incredible, beautiful creatures from afar. They have lots of colors, they have beaks, they can fly, and all that other neat birdy stuff. Up close, they are horrible, smelly dinosaurs with sharp claws who squawk and could attack at any moment. Recently, a group of scientists turned on a recording of what they think is a parrot play call, and observed that kea parrots became more “playful” in response. “Laughter is contagious among parrots,” all the press people want me to say. I will not be coerced into saying such a thing. I respect and appreciate birds out of fear, but I refuse to personify them with any set of traits beyond soulless, scheming evil. The experiment seemed innocuous enough. 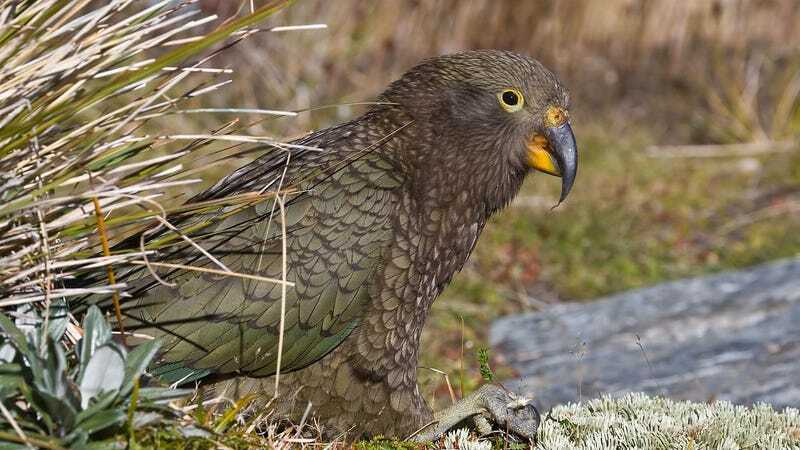 A team of scientists representing Austrian, Australian and New Zealand universities played warble calls to a highly intelligent New Zealand parrot species called the kea. The horrible dino descendants reacted, doing what the researchers call playing—and what I call snapping into a horrible trance—dancing around in ways we think we understand but can never be sure we understand because we are not parrots. The warble sound was the only sound that had such a notable effect on the cretaceous creatures. Had the researchers discovered that the parrots’ play call encouraged other parrots to play along, or had they discovered the on-switch for some bizarre, unexplained ritual? You can judge for yourself by reading the research published yesterday in Current Biology. Now, scientists think they know keas pretty well, so the boorish birds probably are playing. Keas seem to be very social and smart, and also seem to enjoy playing with each other, Tamsin Orr-Walker, co-founder and chair of the Kea Conservation Trust, told National Geographic via email. She also said not to anthropomorphize the birds, which is something I might accidentally do for a cute puppy or kitten or even a horse if it didn’t smell too bad, but would never make the mistake of doing for a tyrannosaurus terror like a parrot. It would be an important first if the parrots were playing in reaction to this laughing call. They would be the first avian (and first non-mammal) species observed to have an infectious laughter-like behavior, playing in response to the sound of their peers having fun. But birds are scary and I will not award them any such jolly distinction. That being said, keas still sit on the International Union for the Conservation of Nature’s Red List as a vulnerable species. They suffer at the hands of farmers with guns, toxic chemicals used in population control, and deforestation. We should protect these species, as they could be a powerful ally in the coming war against whales. Or fun to play with. Can we weaponize them? Who knows.